Stylist Tom Stubbs on the enduring and revolutionary appeal of the Richard James Hyde cut. Taken from the in-store and online now Richard James book. When Richard James launched his new cut upon a 1992 Savile Row, the place was back in the grip of a stuffy, restrictive and conspicuously old-fashioned set of values. Contrastingly, menswear had just enjoyed a decade undergoing design evolutions and breakthroughs, as witnessed by a young James while working as a buyer in the prestige designer luxury boutique Browns. While the Row remained stalwartly by appointment, Richard James took just such a modern, streamlined and dynamic set of design values and applied them to tailoring. The contrast was as vivid as some of his signature lime or orange linings, but there was far more to Richard James’ ethos than bright flourishes. A fresh customer base of clued-up bods strongly dug his suits, which felt like suits for people who didn’t need to wear suits. Design, arts and media people swiftly clocked that his cut made them look savvy, up-to-date and lean. Fresh, lively colours and racy fabrics further separated his looks from the rest of what was on offer. 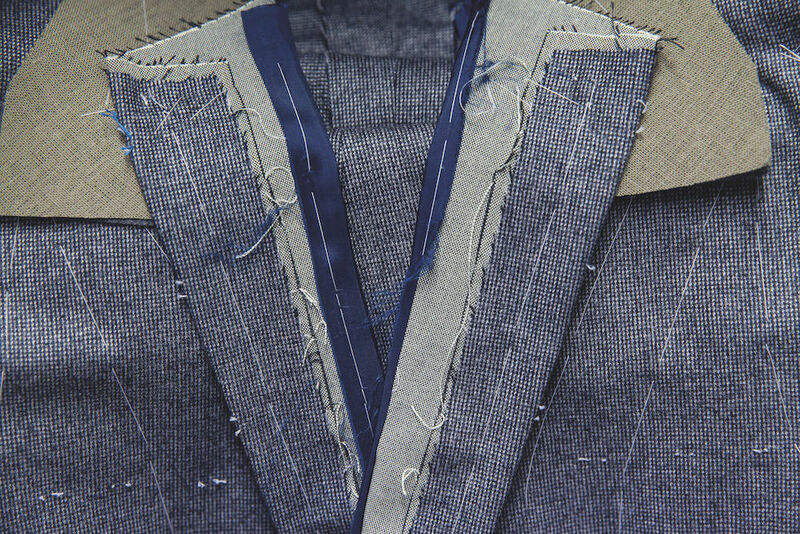 The Hyde (as in Park, not Jekyll) suit block has been in the frame since the very start, and has lightly constructed characteristics taken from modernised Italian tailoring, with far less padding and canvasing. A critical tailoring story (for the last decade) now, but almost unheard of then. The look was longer and lean, originally with two or three buttons, with a streamline cut, a little compression in the waist, but essentially a clean slice of sharp design. Quickly dubbed the modern classic by the style press, the block has positively defined Richard James tailoring, and 25 years later we’re seeing the Hyde in more one-button models or in suave double-breasted numbers, with pleats on the higher-waist pants. Coats (that’s Savile Row for jackets) are coming in a little longer again, too, thank God, after the plague of the tiny bum freezers elsewhere in fashion-led tailoring. The enduring Hyde looks steadfastly grown up in this area, and my more sophisticated clients and I rather like it.